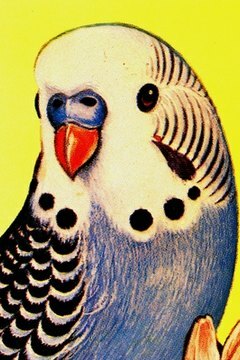 To breed a pair of budgies, also know as parakeets, both male and female must be at least one year old. Choosing birds that have already bonded with each other increase your odds they will mate and shorten the time before they lay eggs. Setting up a cage for breeding purposes is relatively simple, but you need to take certain steps to ensure the health of the parents and chicks. Set up a cage for each breeding pair. Each breeding budgie couple needs its own cage at least 24 inches long by 16 inches wide by 16 inches high. Budgie Place.com recommends removing the grate at the bottom. If the cage has an irremovable grate, cover it with black-and-white newspaper. Attach a wooden nest box outside the cage. The best type opens on the side and is larger and longer than most lid-top models. Side-opening boxes reduce the chances of eggs being damaged and reduce the risk of splayed legs in chicks. They are also easier to clean and maintain. Insert a wooden concave circle in the bottom of the box to prevent splayed legs, a deformity that occurs in chicks due to improper bedding. Cut a 2-inch thick piece of board to fit snugly inside bottom of breeding box. Hollow out a concave circle in the center of the board about an inch deep and 6 inches in diameter. Layer unscented pine shavings in the bottom of the box and over the concave insert. Place a cuttlebone, mineral block and iodine salt spool in the cage. Equip the cage with at least two perches. Include a safe, natural-wood branch. Attach two water tubes to the cage, as well as placing a large jar feeder on the cage floor. Parents will go through a lot of food and water while caring for their chicks. Place pieces of soft wood on the cage bottom for the mother to chew on to help her get in the mood for breeding. Purchase the wood at a pet store to be sure it is safe for your bird. Breed two or three pairs at a time. They will stimulate each other into breeding. Breeding season is from October through March. Keep the room temperature between 65 to 75 degrees. Humidity helps the eggs to hatch better. Provide good light but not direct sun during the day. Cover the cage for 12 hours at night. Use a full-spectrum light bulb in the breeding room to assist in vitamin-D formation and to allow for proper vision. Don't interfere with the breeding birds. Clean the cage at the same time daily.